Izzy is about to turn 41. It doesn't seem like a momentous occasion, but to her it is. Her mother committed suicide on her 41st birthday. She wants to have a calm, relaxing birthday but her father and her sister come to visit for the weekend to help her through the big day. The story fluctuates between the present day, as she deals with her sister, father and niece, and the past as she revisits her childhood with her mother and the events that led up to her death. 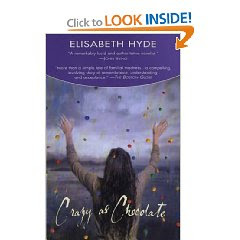 Crazy as Chocolate is a decent book, but definitely not one of the best I've read recently. I had picked it up at a used book store on a whim, and although it was worth reading, it wasn't anything that will stick with me for long. I actually had a tough time getting back into the story after putting it down each time. I think I would have enjoyed it more if I had been able to read it all in one sitting. But I still don't think it would stick with me for the long term. This review was written based on a copy of Crazy as Chocolate that I purchased.